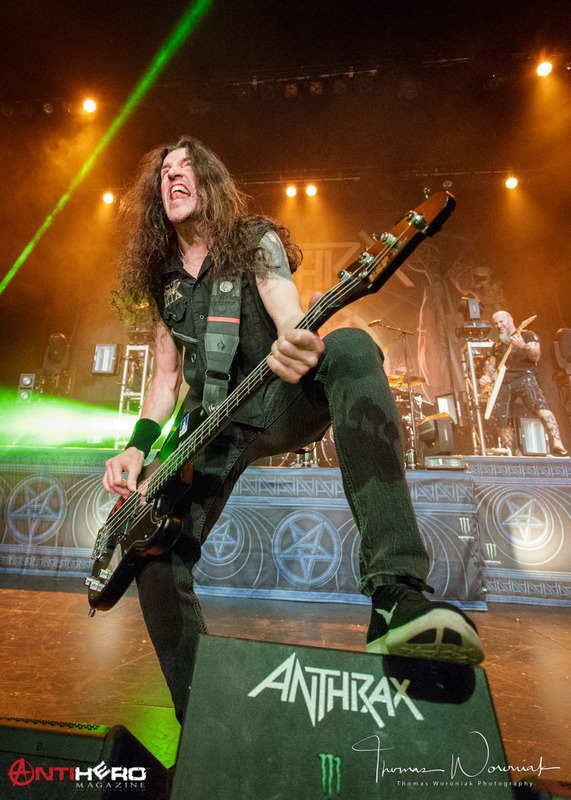 When you’re a metalhead, and one of the members of the Big 4 of Thrash comes to your town you make the pilgrimage. 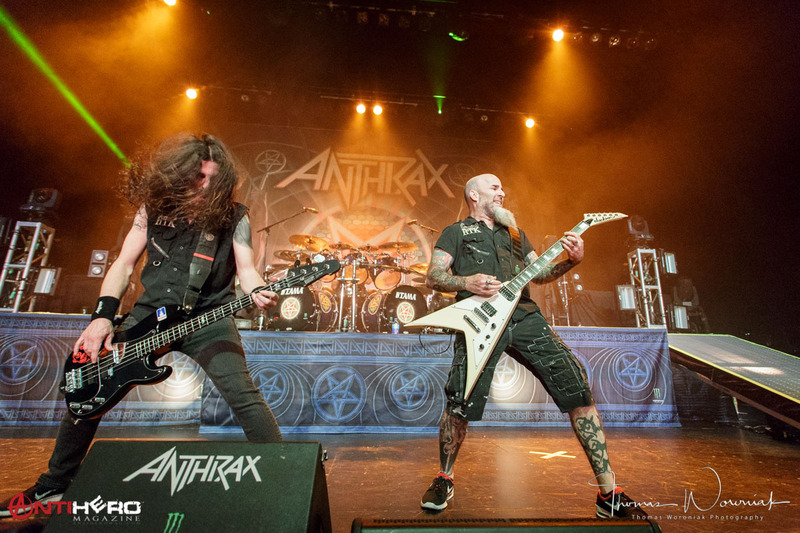 When I heard that original east coast thrash KINGS Anthrax we’re touring with Killswitch Engage on the KILLTHRAX tour, I waited with great anticipation for a Kansas City date. 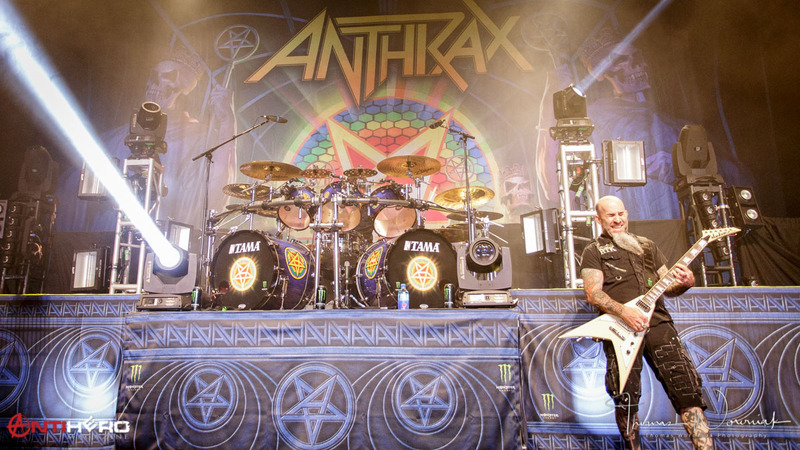 Behold, the announcement came, AND it was on a Sunday, so tickets were purchased. 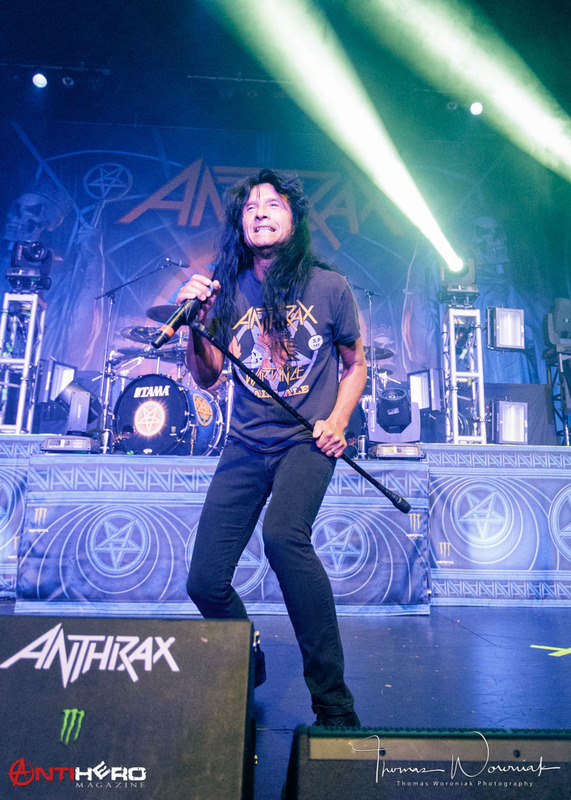 Anthrax and this reviewer go way back, back to the Spreading The Disease album, and their first show in Kansas City back in 1986. 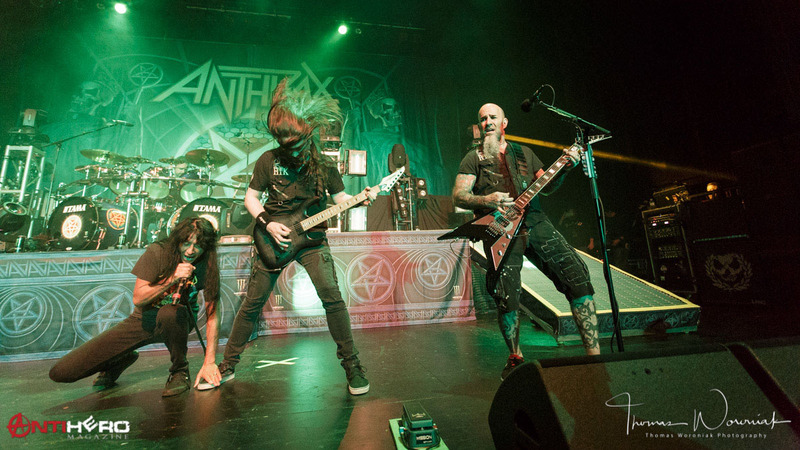 When googling the setlist from prior shows, it looked as if they’d been including “Madhouse” and “Medusa” from Spreading The Disease, and they most certainly did. 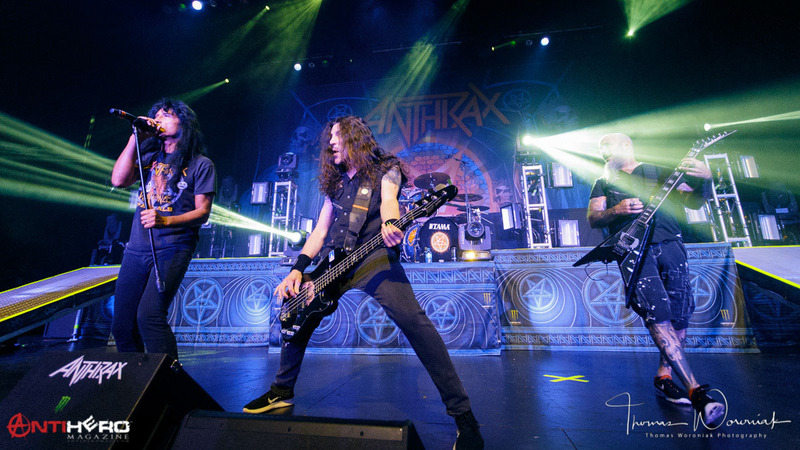 Such classic tracks that laid the baseline for what great thrash songs SHOULD sound like. 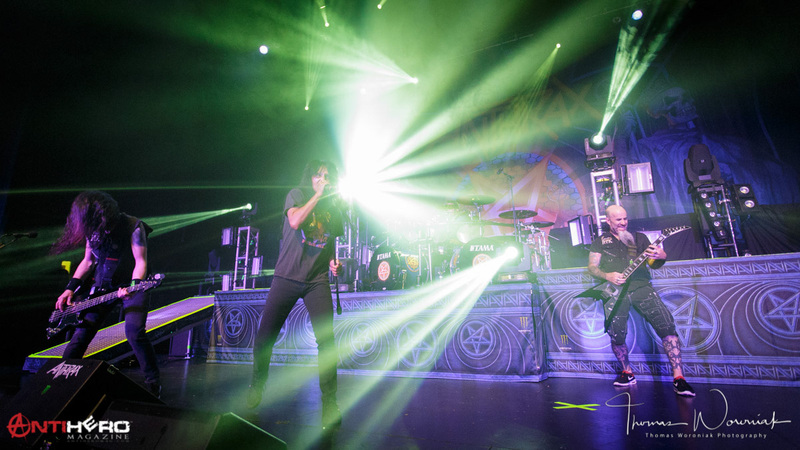 When you think of a perfect set of Anthrax songs, you’d like to hear classics such as “NFL (efilnikufesin)”, “I Am The Law”, “Caught In A Mosh”, “Among The Living” and “Antisocial” in the set, and Anthrax did not disappoint, including all of those classics, plus songs off the latest studio releases, 2013’s Worship Music and 2016’s For All Kings; “Fight ‘Em Til You Can’t” off of Worship Music, and “Blood Eagle Wings” and “Breathe Lightning” from For All Kings are the newest offerings from Anthrax’s catalog. 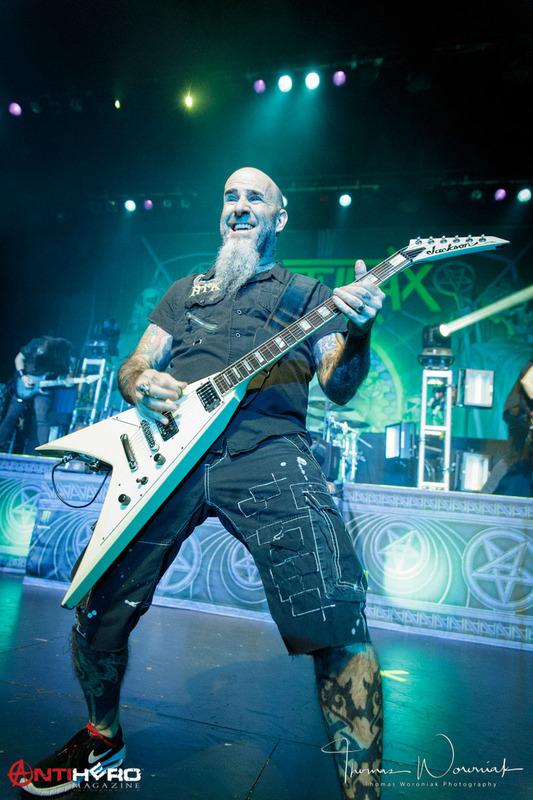 Belladonna was expecting the crowd to sing “NFL!”, but most of the crowd was quiet, and Scott Ian said it was “weak”. 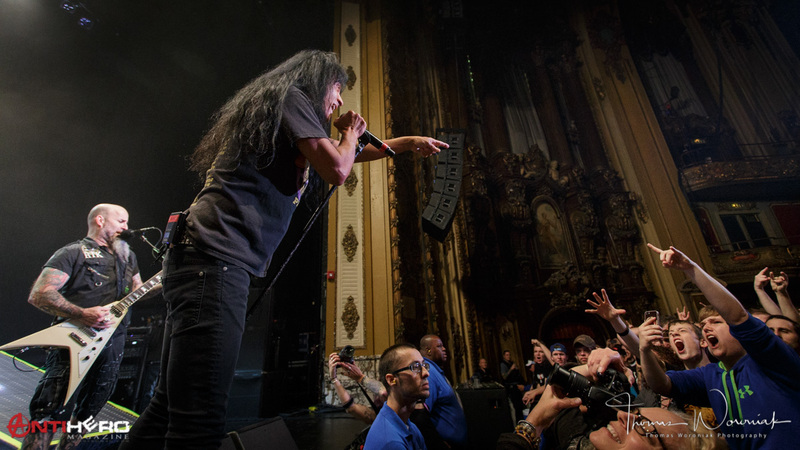 The small gathering of aged metalheads, myself included, we’re giving Joey exactly what he wanted to hear, but we were the minority on this night. 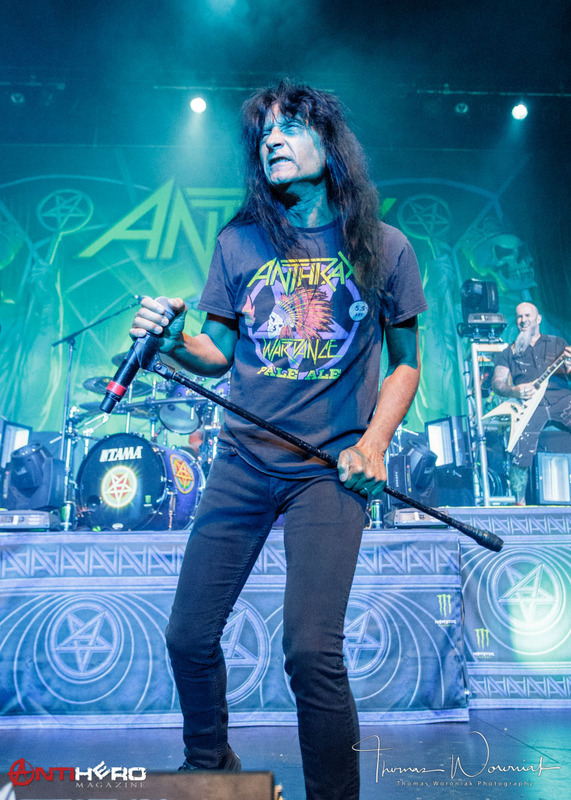 Joey, Scott, Frank, drummer John Dette and lead guitarist Johnathan Donais brought down a house of metalheads, young and old alike. 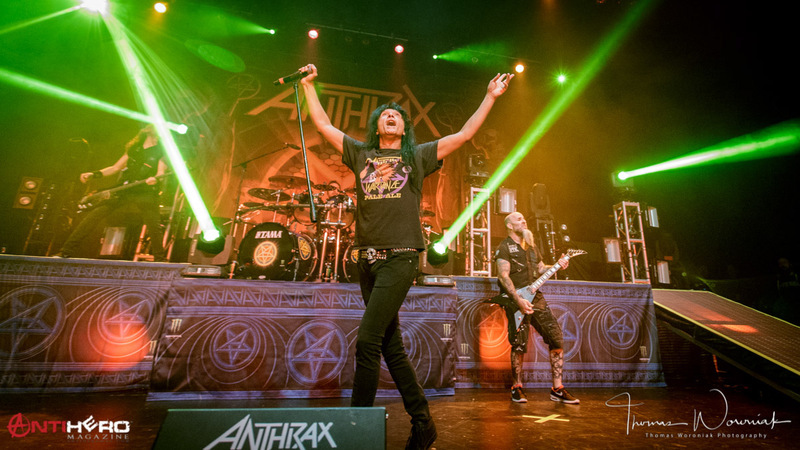 All singing Anthrax classics in a style not far removed from Karaoke. 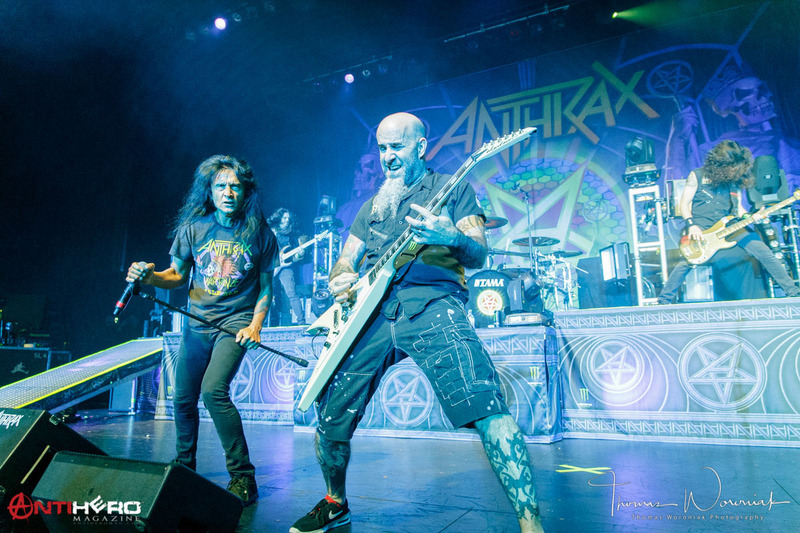 One very cool thing that Anthrax was providing thru F.Y.E., was a post-show autograph session. 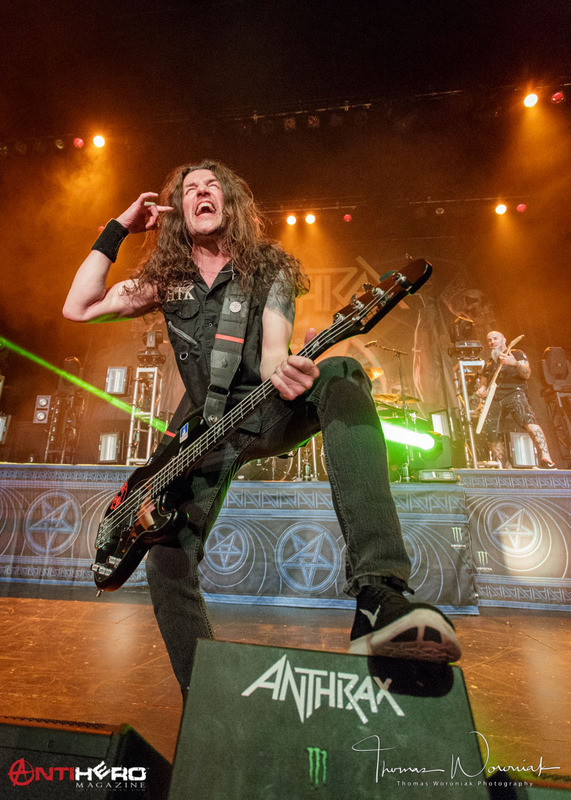 Yours truly obtained the wristband, bought the For All Kings CD, saw my favorite band up close and fan-boyed, talking with bassist Frank Bello about his signature bass. 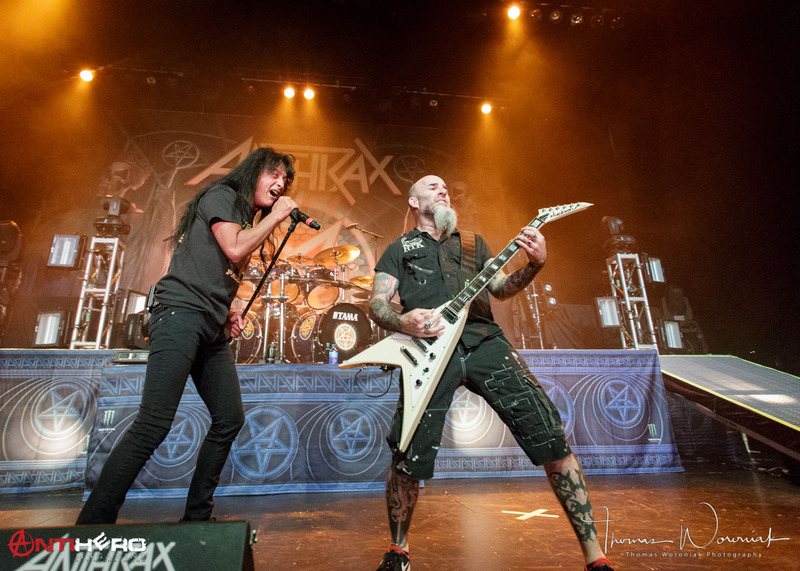 Anthrax have always been the “class clown” of the Big 4 – laughing, joking and moshing their way into heavy metal history. 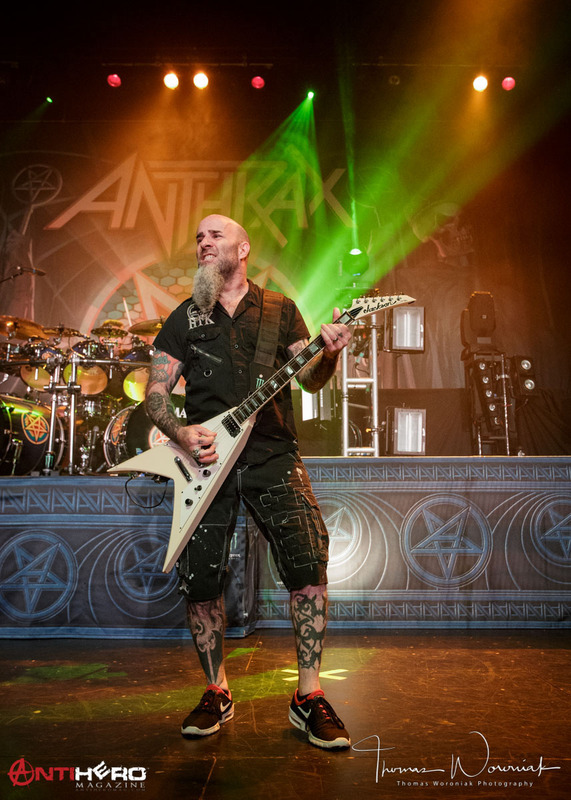 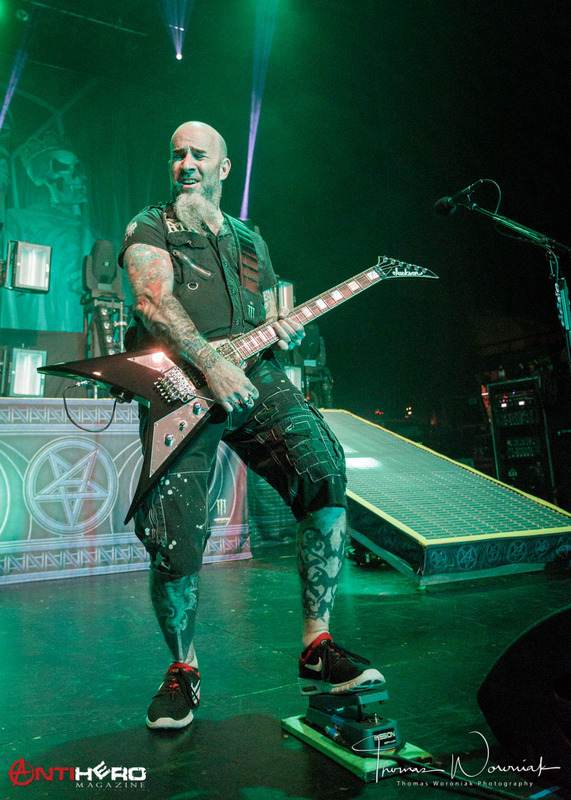 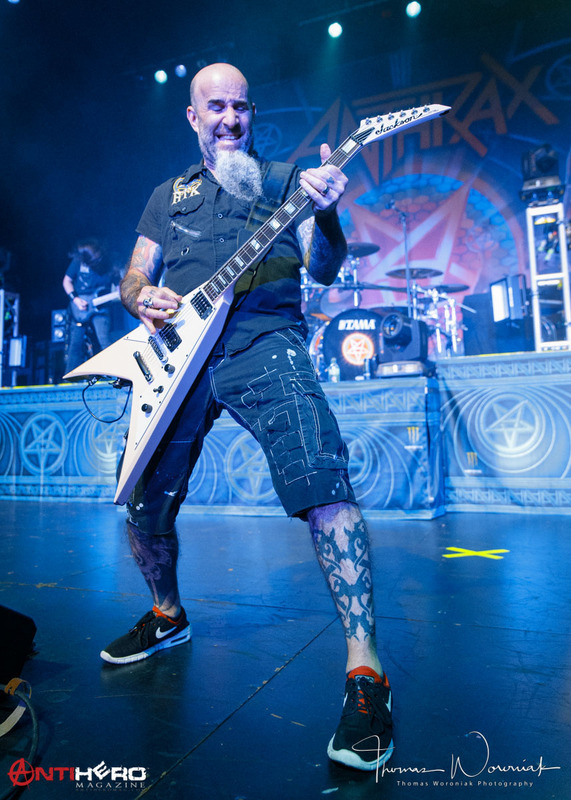 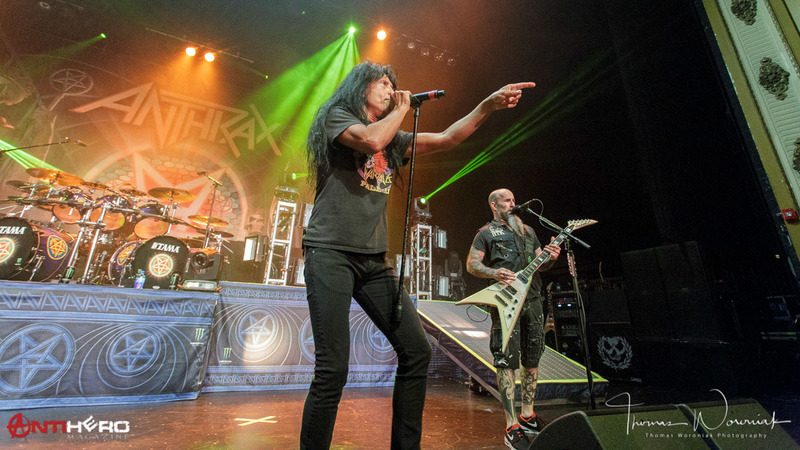 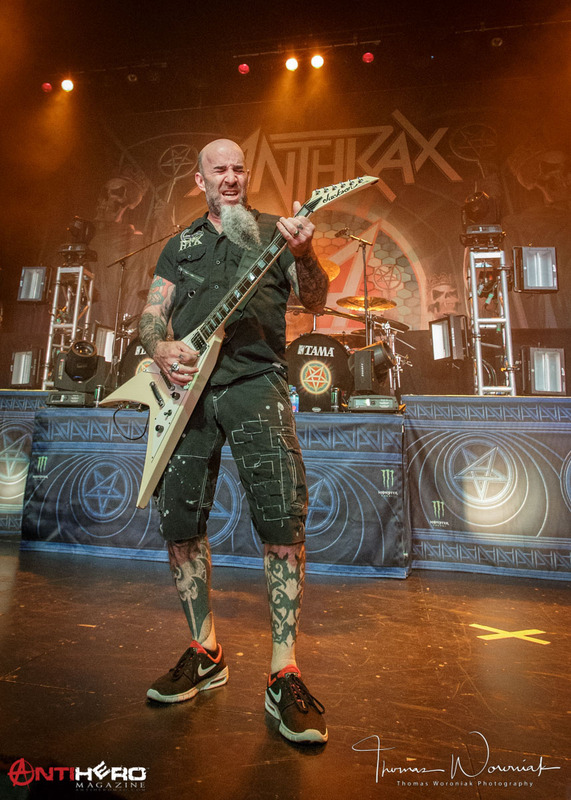 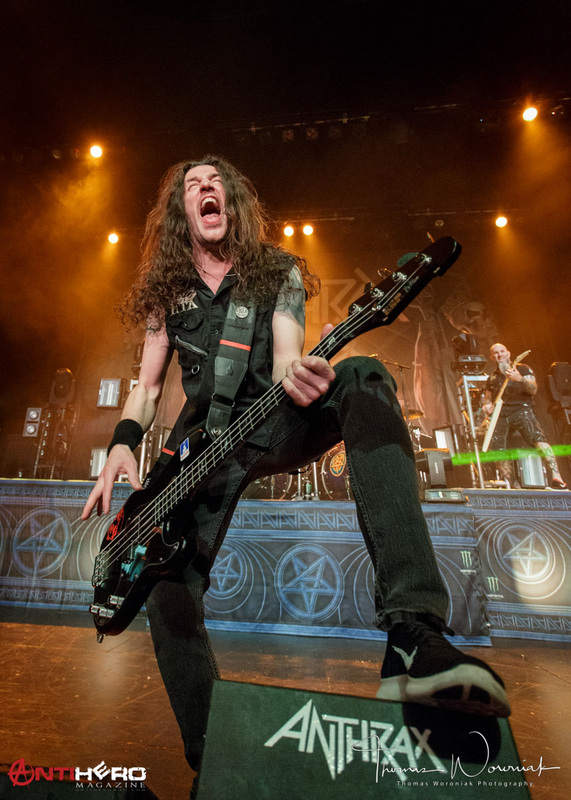 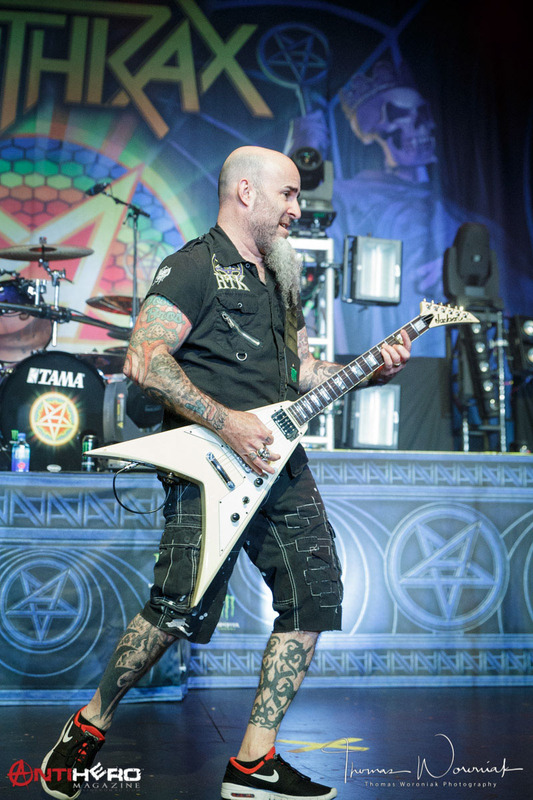 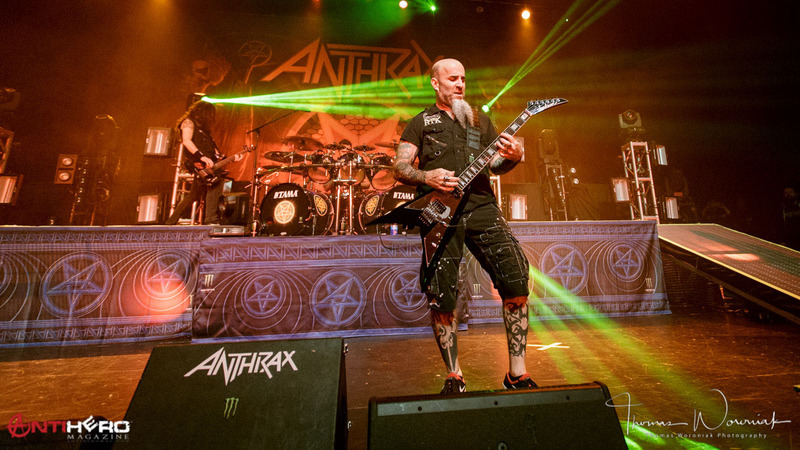 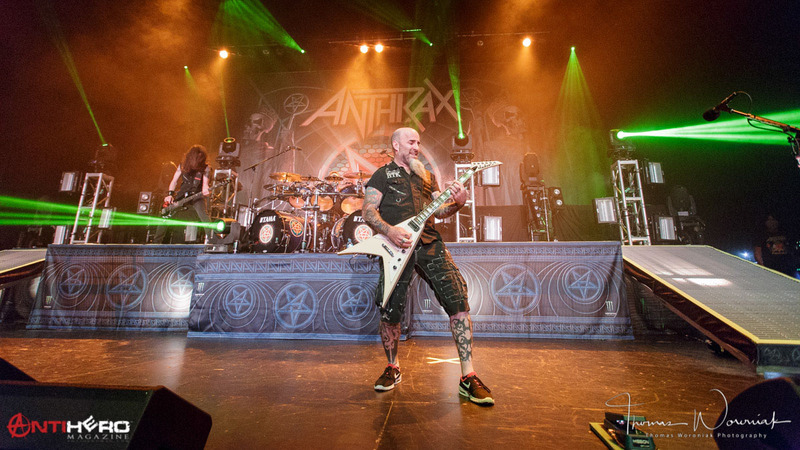 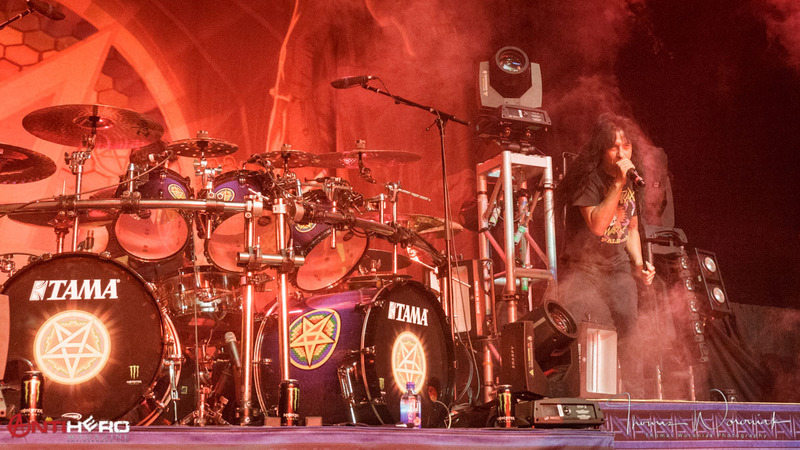 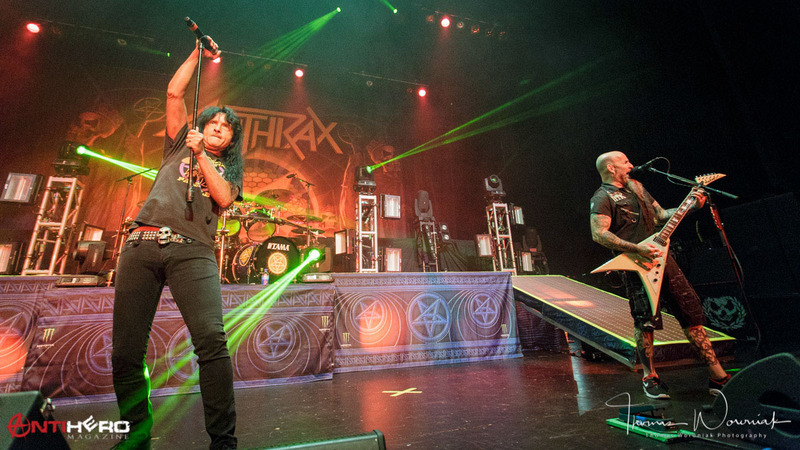 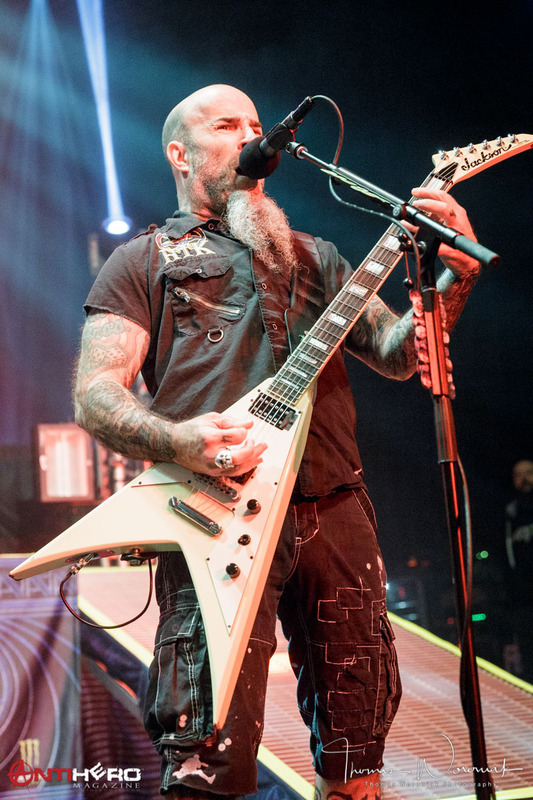 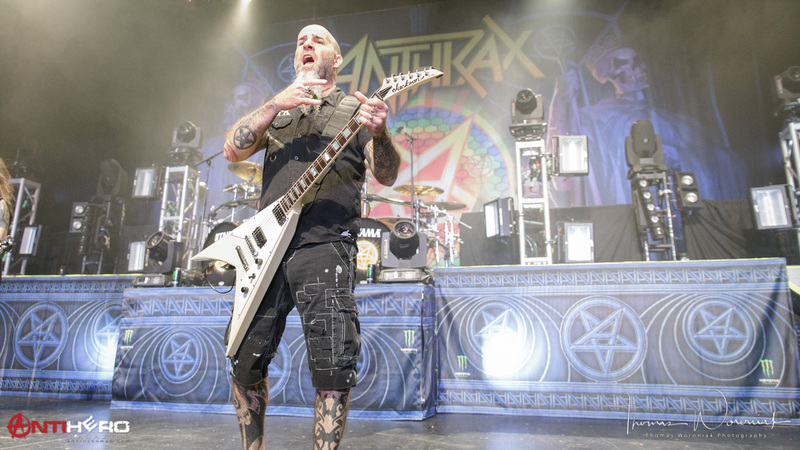 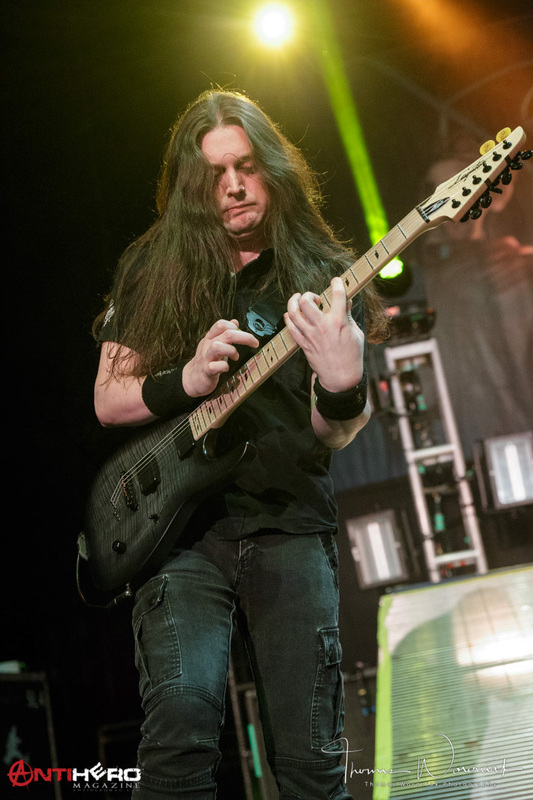 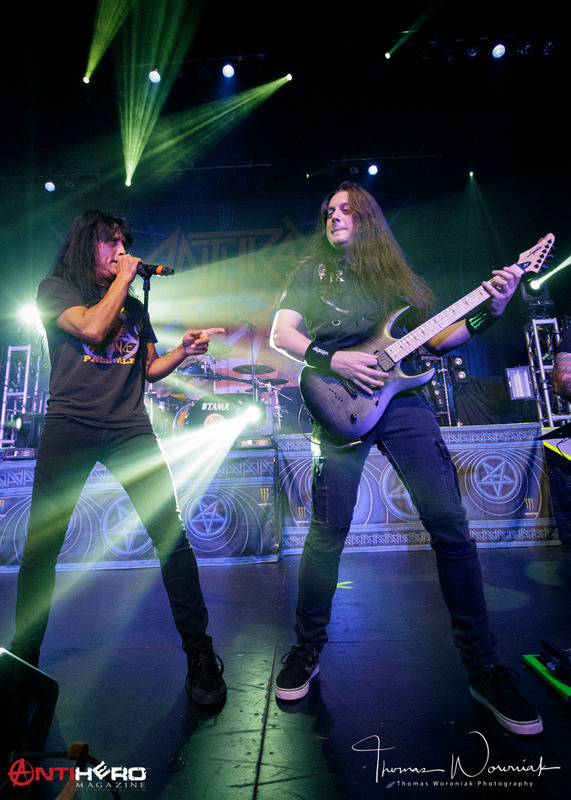 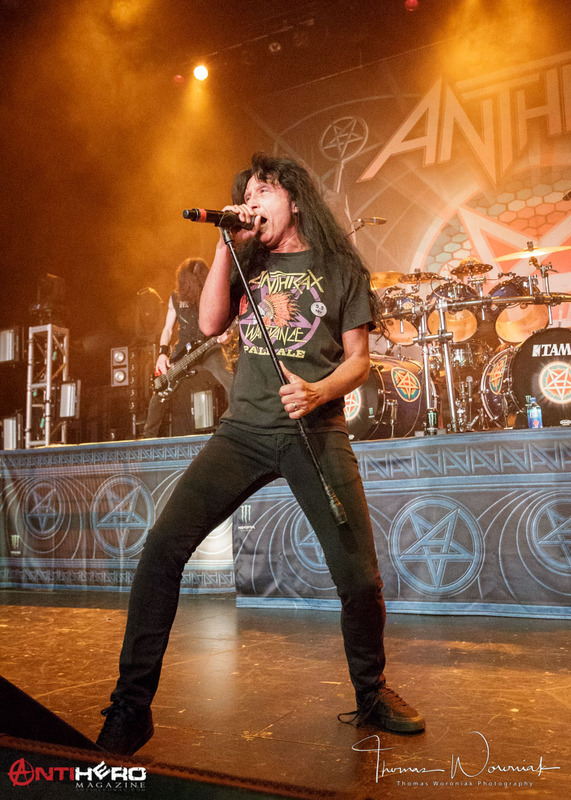 On a rainy Sunday night at the Midland Theater in Kansas City, Anthrax PROVED to the crowd that the still had what it takes to get old and new fans alike “caught in a mosh”.